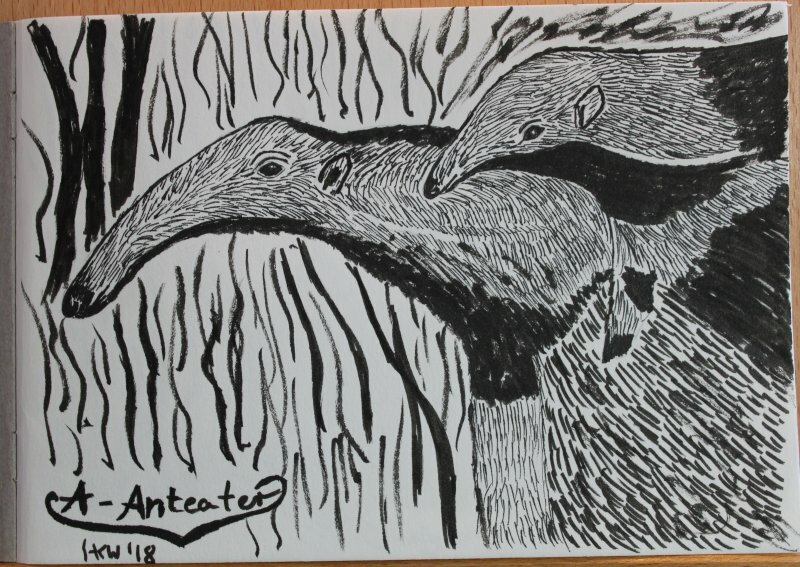 In this post I am sharing with you my Inktober 2018 experience. This year I took part in the Inktober challenge for the first time. Last year I noticed the #Inktober challenge on Instagram and got curious. Back then I didn’t have the foggiest what Inktober was or who created it. It’s a challenge created by graphic artist Jake Parker, who started it in 2009, mainly with the purpose to improve his own drawing skills. Inktober took off on social media and more and more artists started taking part each year in October. So, what is this challenge? 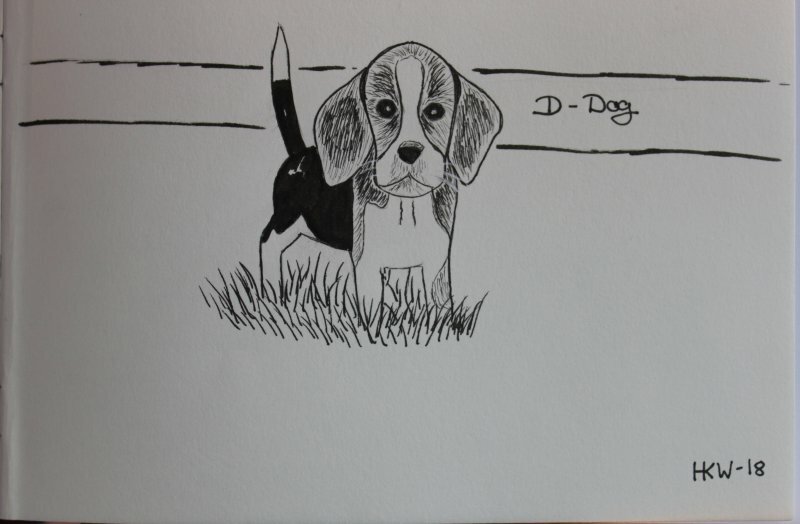 For the 31 days in October you are supposed to create a drawing each day, only using ink. 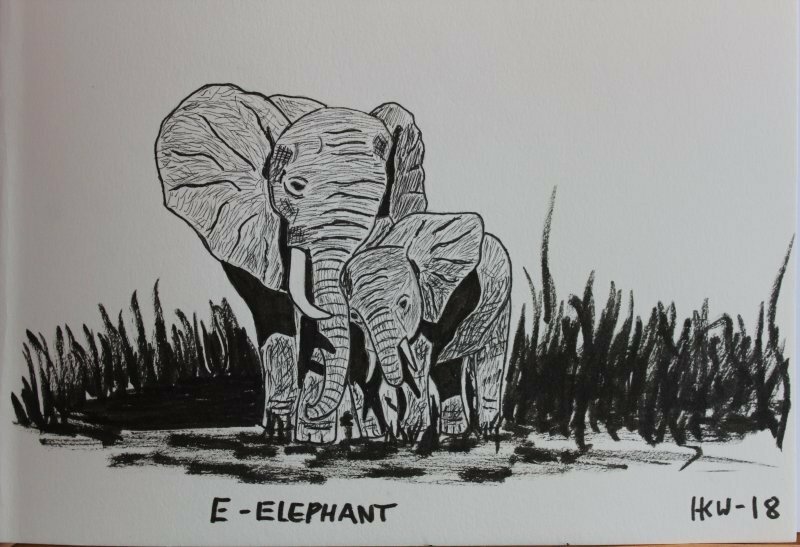 This can be brush pens, dip pens, biros – anything that contains ink. There are official prompts to help you come up with ideas too – and you are allowed to use pencil underdrawings – which was a blessing for me, as I am new to this and prefer to have things sketched out in pencil first. I watched a few artists on YouTube who had a few “survival tips” and instead of following the official prompt list by Jake, I decided I wanted to draw an animal each day following the alphabet. 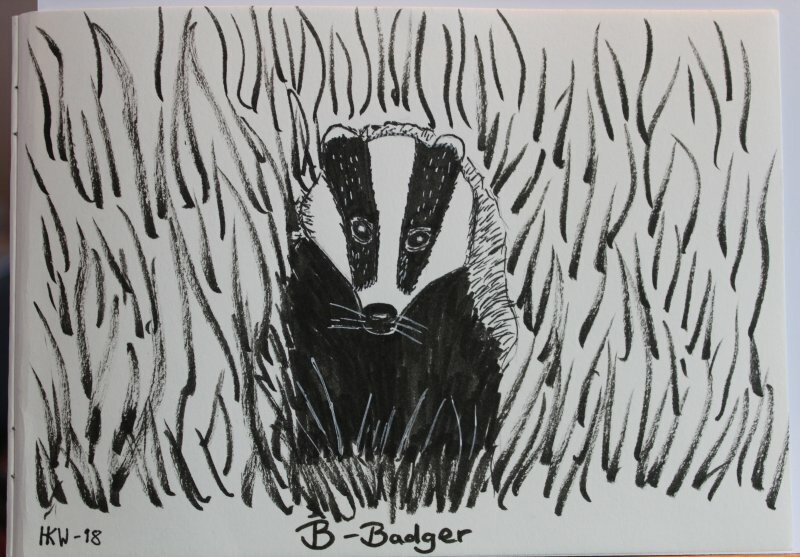 I started my Inktober with a drawing of anteaters, followed by a badger, a cheetah family and a beagle (as in dog). 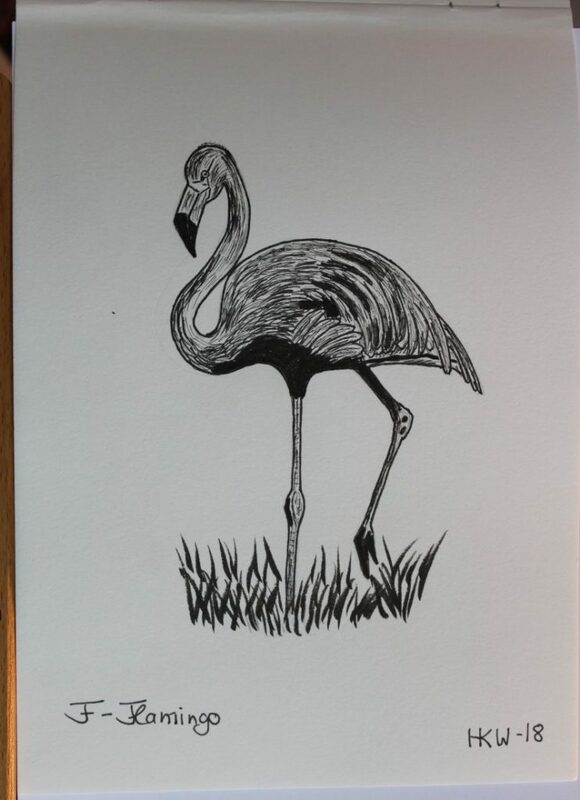 I continued with elephants, a flamingo, a giraffe and a hare. 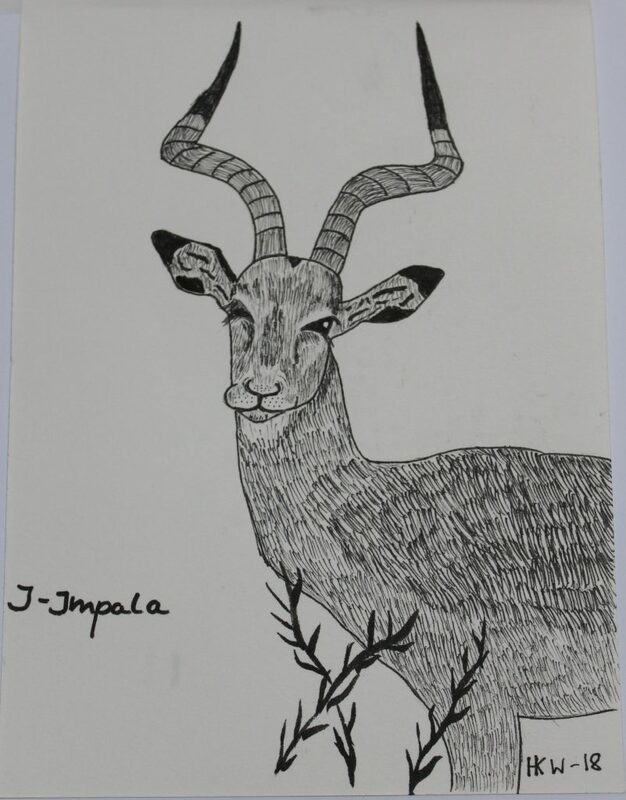 Followed by an impala, jaguar and a kangaroo. 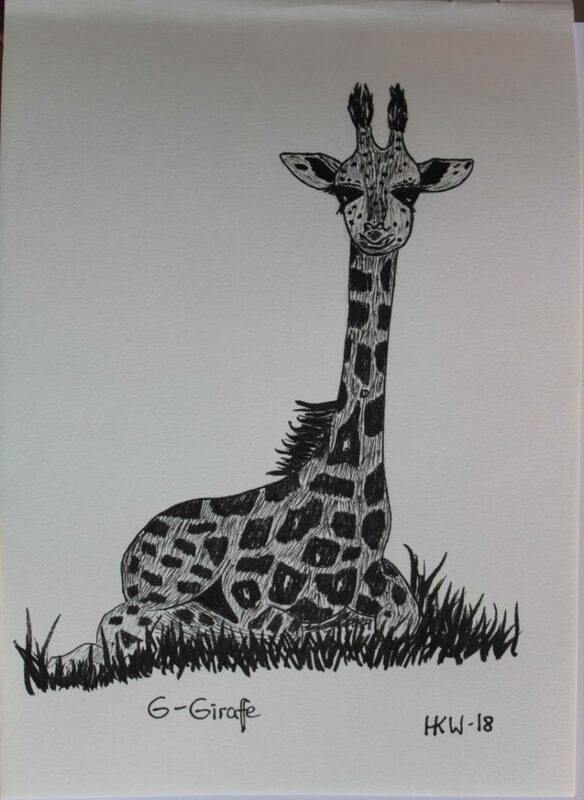 For each of these drawings I started to create the outline first with a pencil and used the pens I had – which is a Pentel brush pen (mostly for the background, the focus was really on the animals themselves, so the backgrounds had not much detail), a black Faber Castell Prush Pitt pen (B) and a selection of very fine liners by Staedtler. For highlights and whiskers I used a white gel pen – this didn’t always work as well as I hoped. 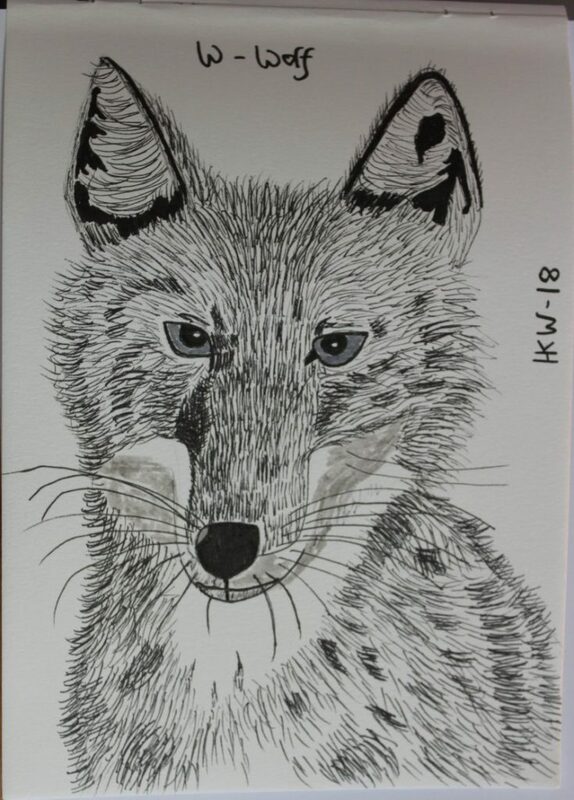 During the first week of Inktober I realised I wanted a bit more colour, so I ordered grey Pitt brush pens by Faber Castell and an assortment of black liners. 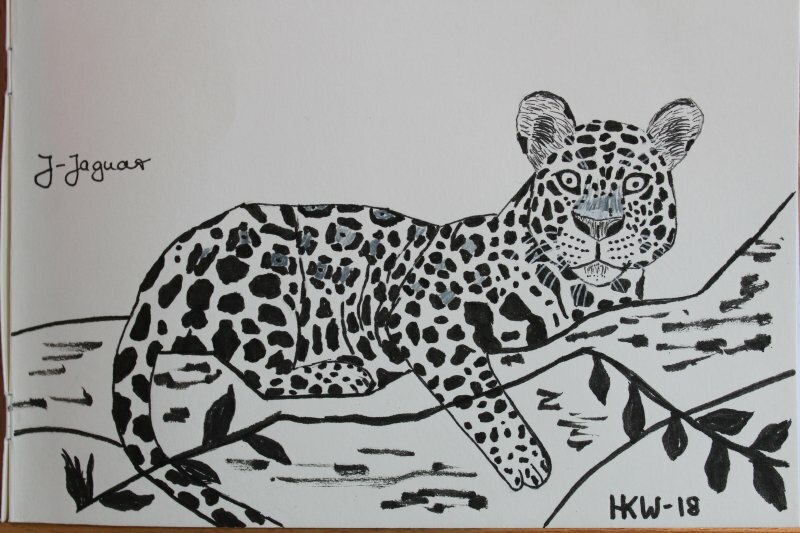 You can see that I tried grey first on the jaguar (that pen was just a simple felt tip pen I had). 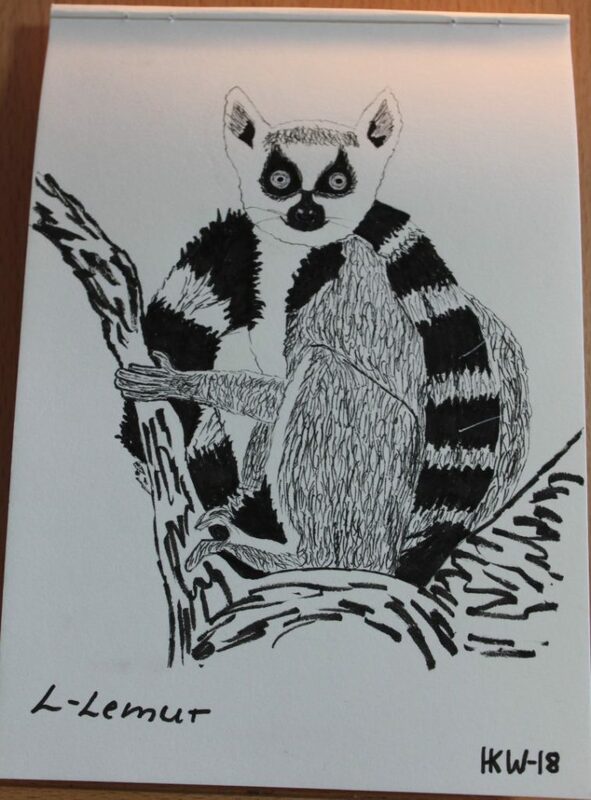 To create different shades of colours, I used the various fine liners according to their size. I soon started struggling with the challenge – not so much for time reasons (though most of these drawings were rather time consuming) but with my crippling shoulder pain. I started to miss a day and had to catch up. I also tried to figure out a better and more ergonomic way to draw. Hunching over your work is bound to affect your shoulder muscles! Members in the Sketchbook Skool Facebook group suggested to try a table easel. And as luck would have it I actually had bought one ages ago – it’s a combination of a storage box and an easel that you can use on the table (made by a company called Reeves). So, I used that and it did make a bit of a difference. I could even use it in bed. I also ordered a stand for my desk so I can work while standing – this supposed to be beneficial for your posture too. 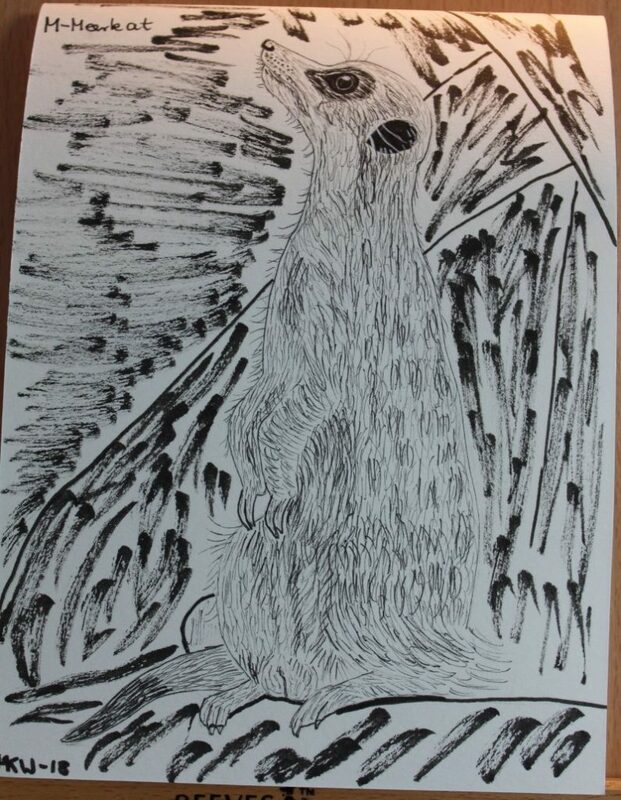 Following the kangaroo, I continued with the lemur, meerkat and narwhal. 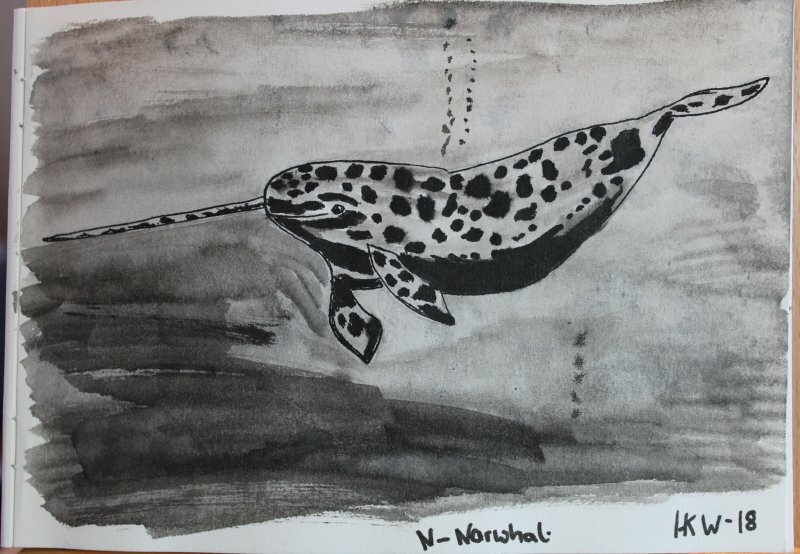 For the narwhal I tried India ink and a nib pen. I don’t think the paper was really designed for this type of ink and I struggled with using the nib pen, because I am left handed. I get the impression that nib pens are designed for right handed people. 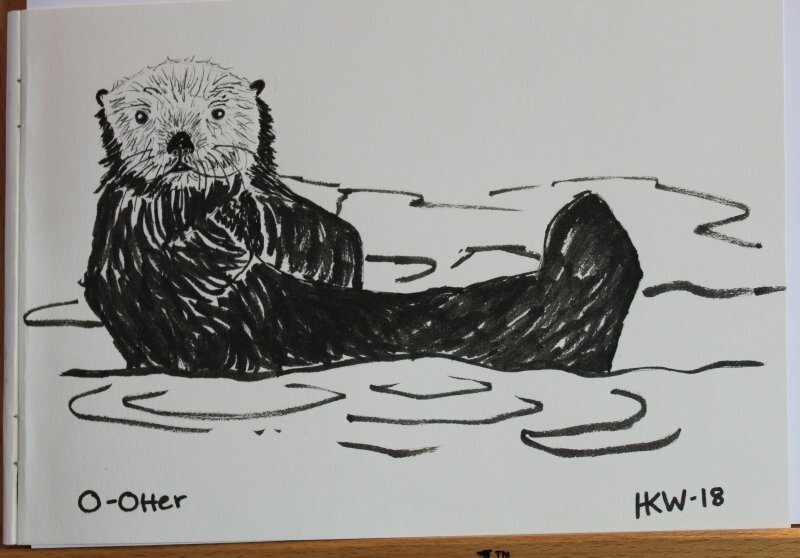 My next drawing was a sea otter. We’ve seen some cute sea otters in Lisbon at the Oceanarium. They are just adorable. 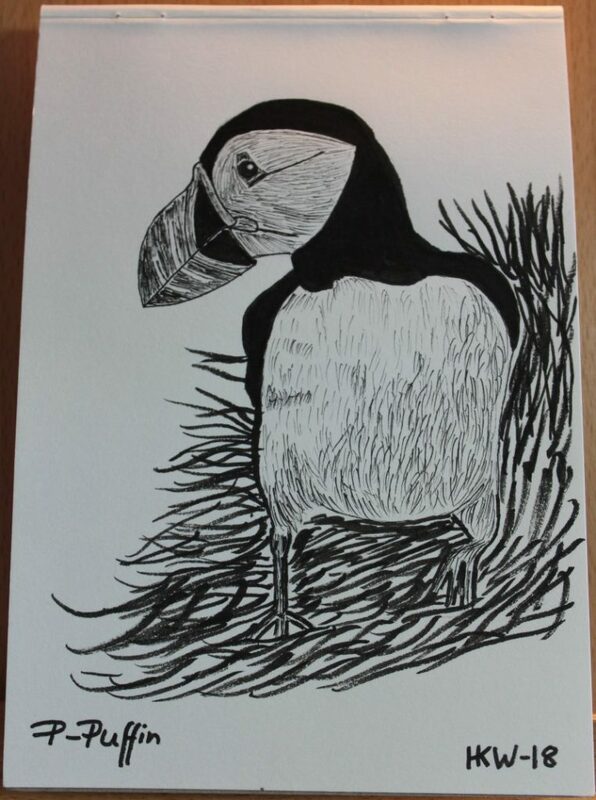 My final drawing that filled my first sketch book is a puffin – and it is definitely something I want to paint with watercolours. Puffins are quite common in Pembrokeshire and are such cute birds. 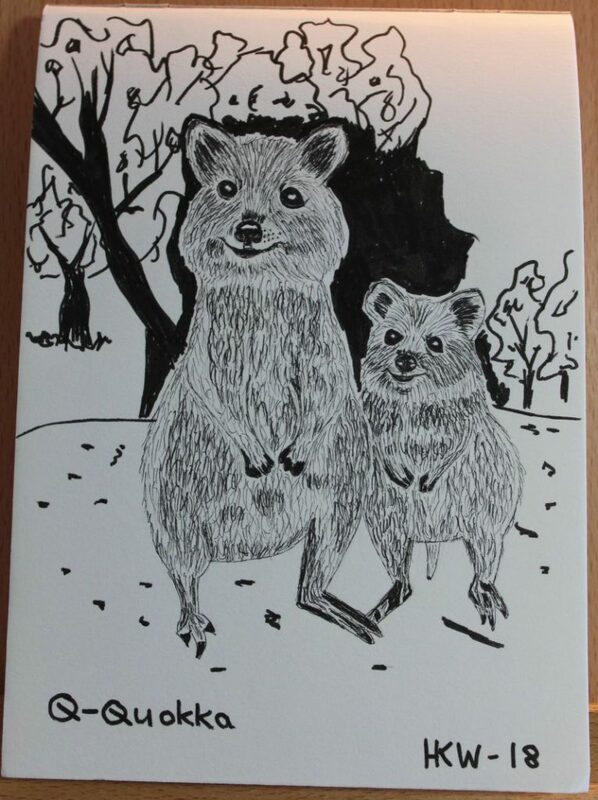 By the time I started sketch book number 2, I arrived at the letter q – and drew two super cute quokkas – they are such smiley creatures. 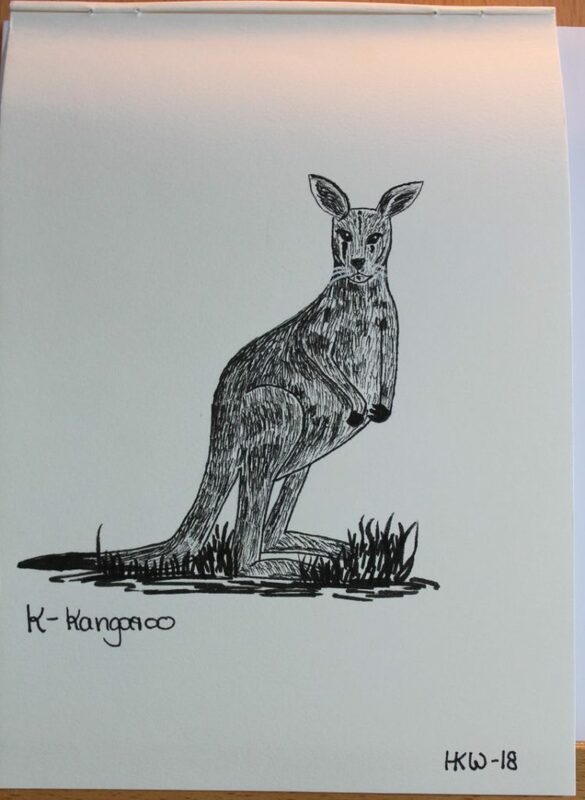 You can find them in Western Australia, Rottnest Island and Bald Island. 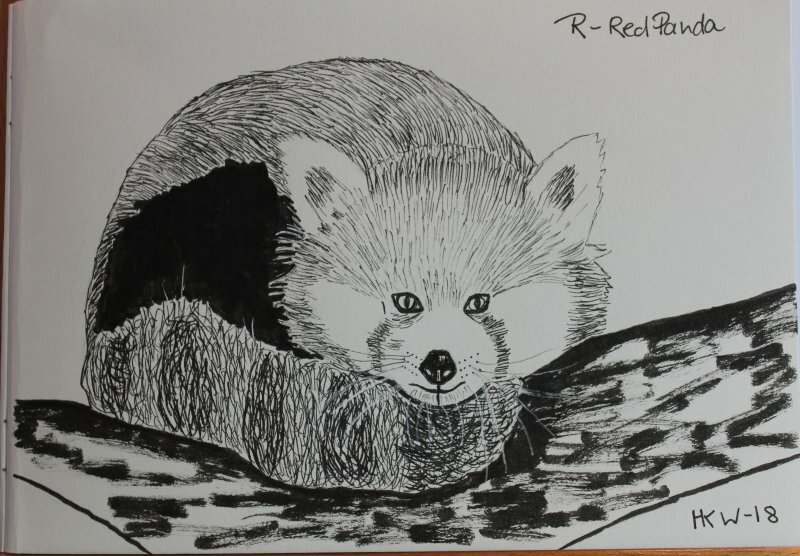 I love red pandas, which is why I decided to draw one. 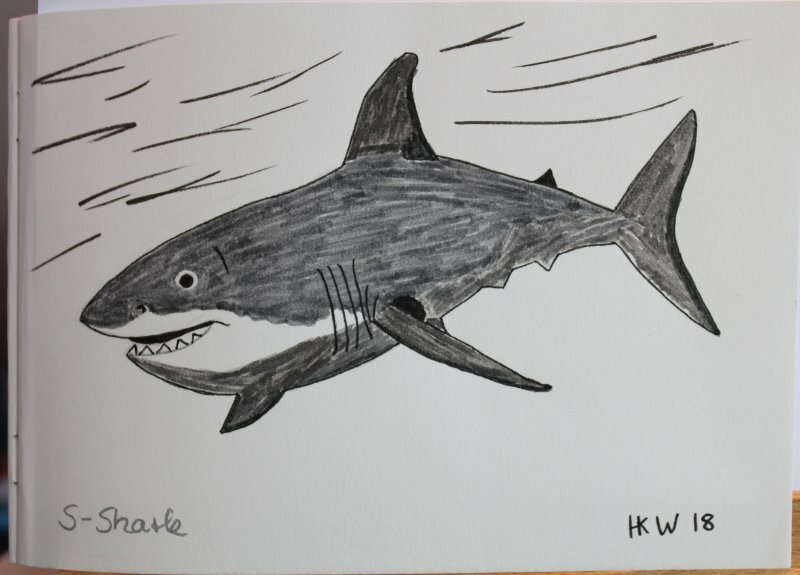 As my grey pens arrived that weekend I decided to try them out on my shark. Not sure if it’s the paper or the lack of practice with these pens, but I was a bit underwhelmed with the result. 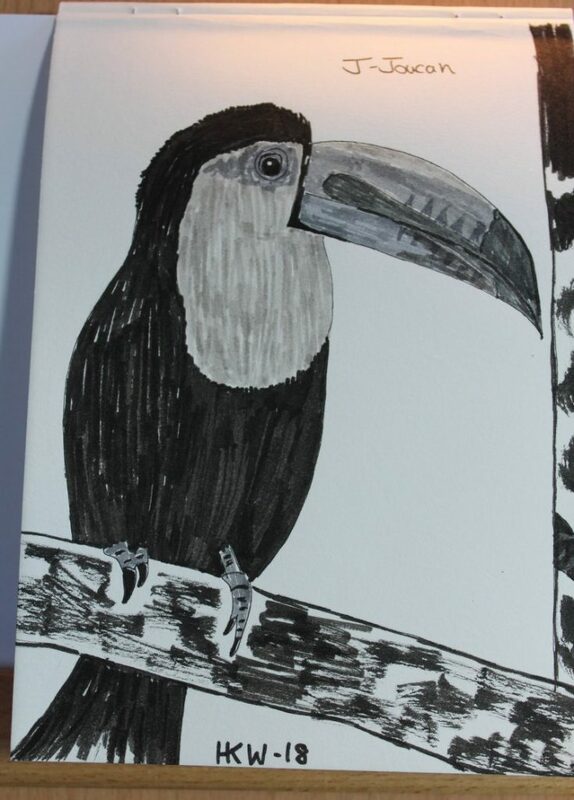 I also used the grey pens for my toucan – another bird I want to paint in watercolours as they are so pretty. This one had a colourful beak consisting of red, yellow and green, which I tried to emulate with different shades of grey. 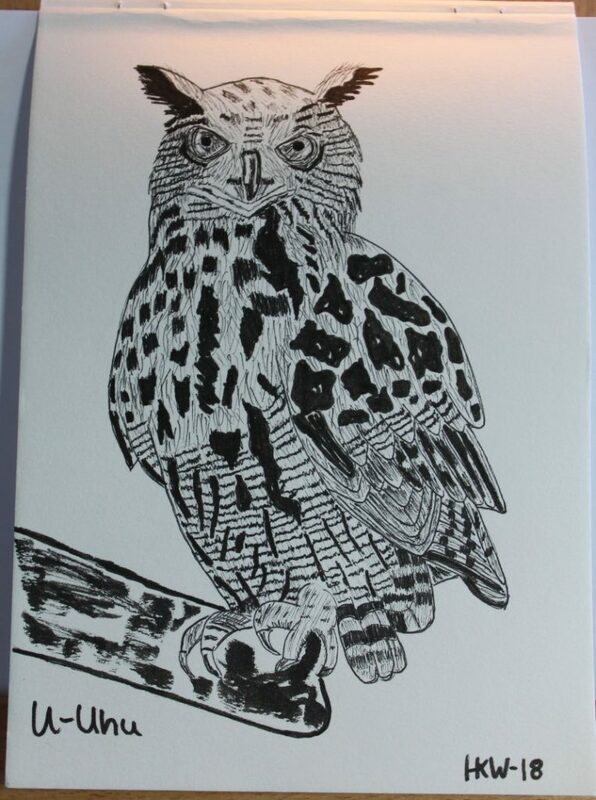 As I couldn’t find an animal beginning with u in the English language I resorted to German – an Uhu is an eagle owl. This one was hard work – it took forever to get the details in. 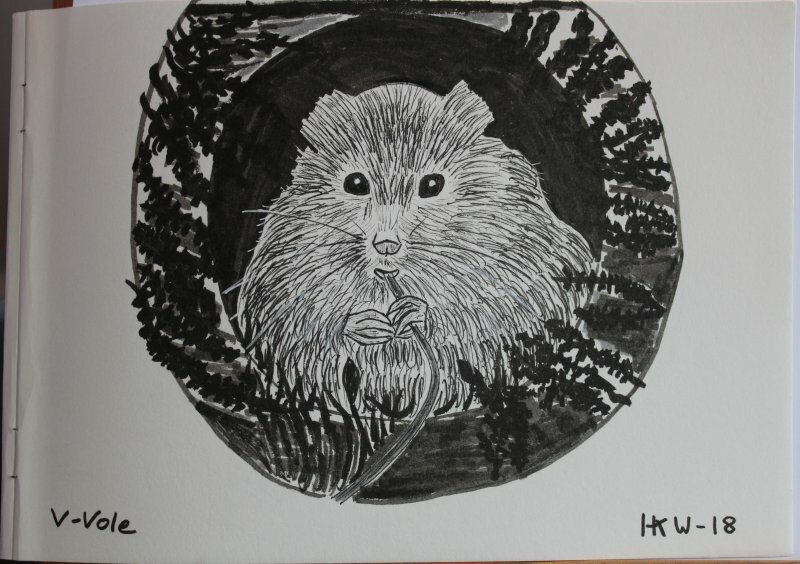 V for vole was easier. For w I drew a wolf and for x I had to ask for help, as I couldn’t think of an animal starting with x. 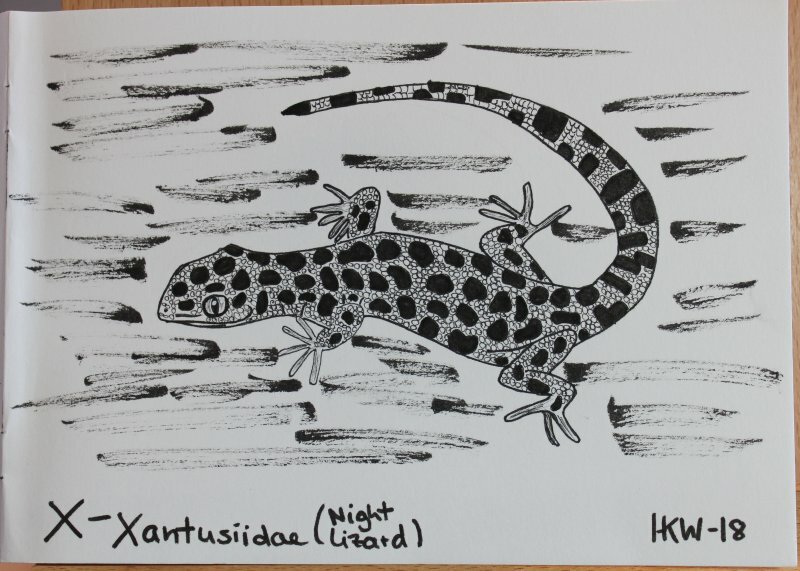 A xantusiidae is a night lizard, so that was my choice for that letter. Drawing the scales took a while, but I think my lizard looks really good. 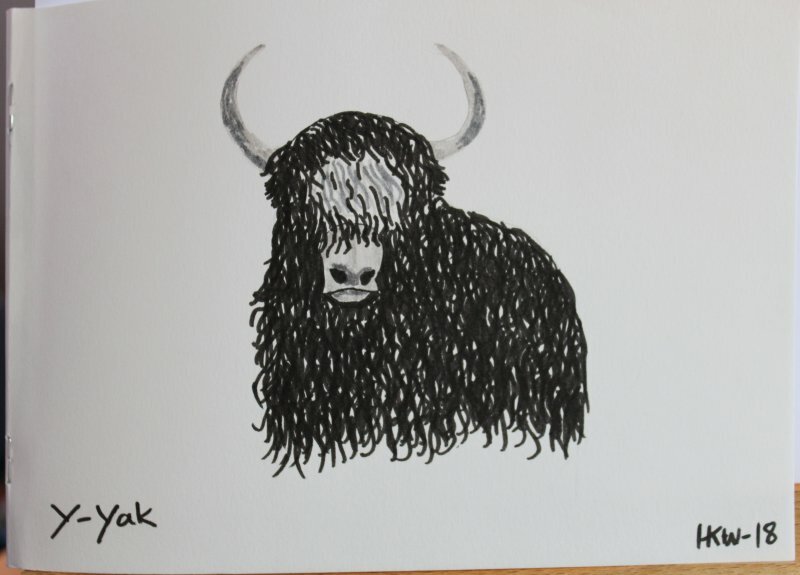 Y for yak – the yak was a lot of fun to draw – such wooly creatures. Again, my grey pens had an outing. And finally, z for zebra. 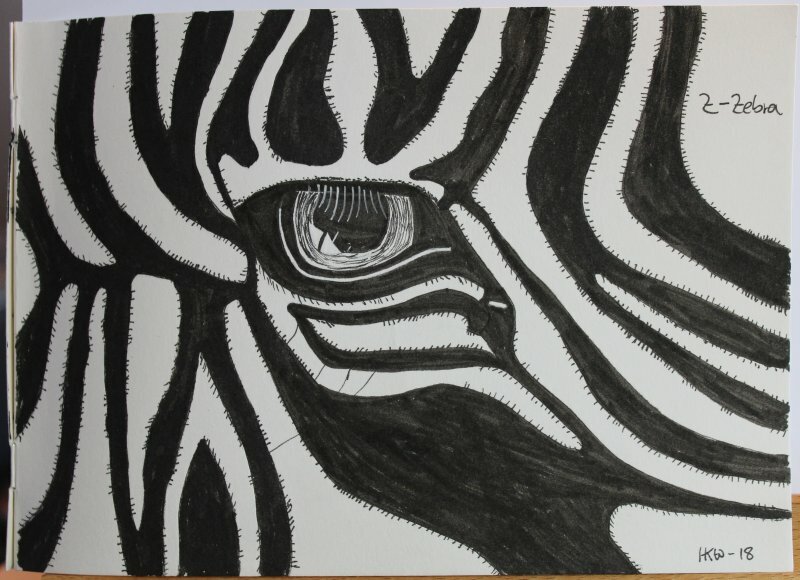 I really liked the cover from BBC wildlife of the detail of a zebra’s eye – and didn’t fancy drawing a whole zebra. This drawing proved quite popular on IG and FB. I still had days left to fill and also lost a few days due to pain issues. So, I played catch up with the next three drawings and finished them within two days. 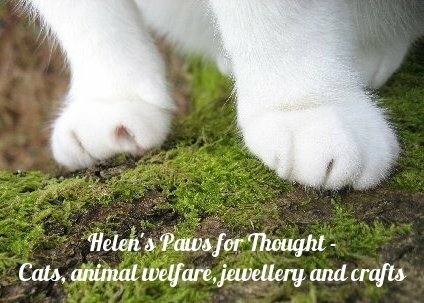 The first one is a drawing of our cat Bobby when she was a kitten – it’s from one of my favourite photos of her. 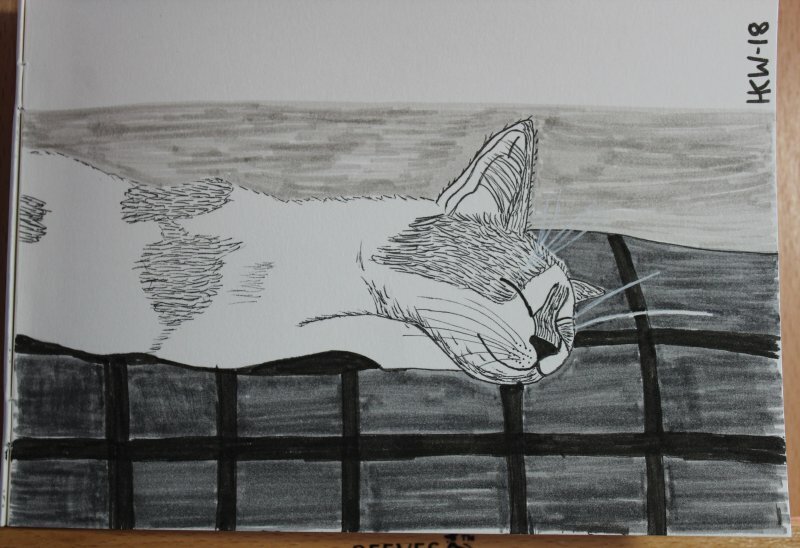 The tricky thing with Bobby is that she is mainly white with bits of tabby – translating that into a mainly monochrome drawing wasn’t easy. 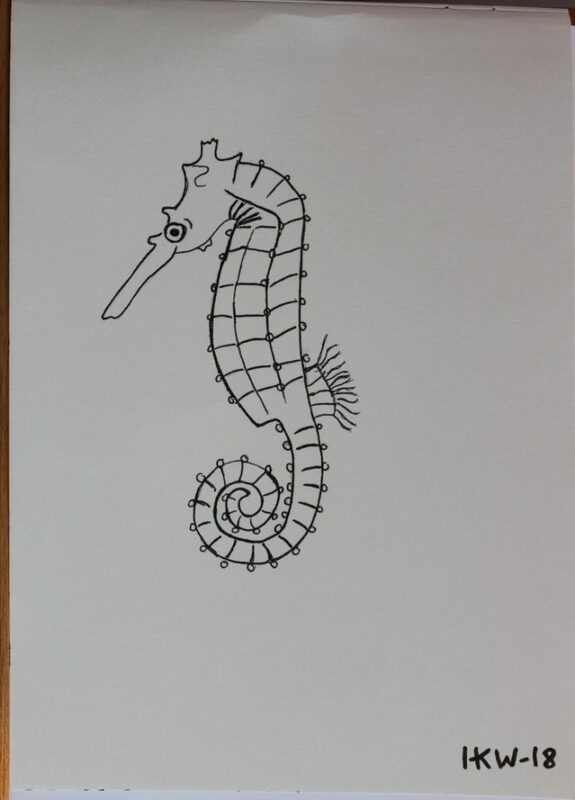 I kept my seahorse simple, as I just wanted to catch up and finish these three drawings. 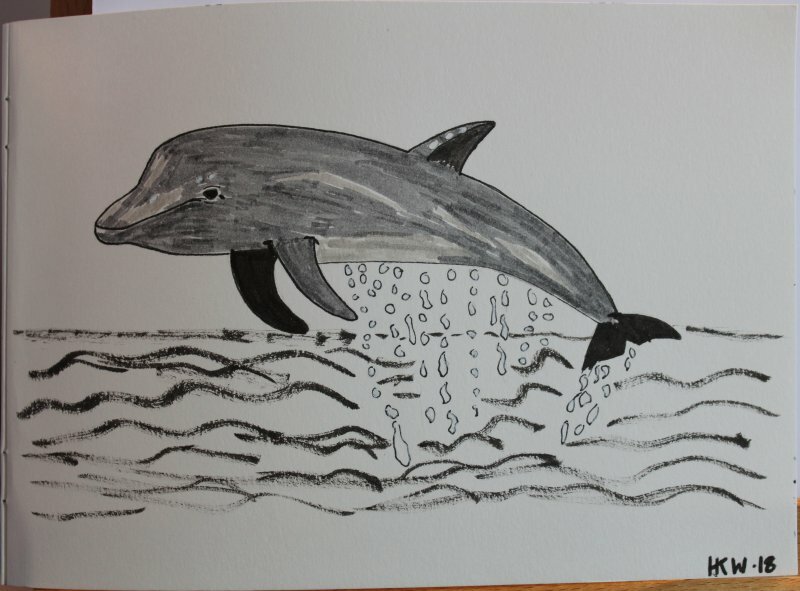 For the dolphin I also used my grey pens. 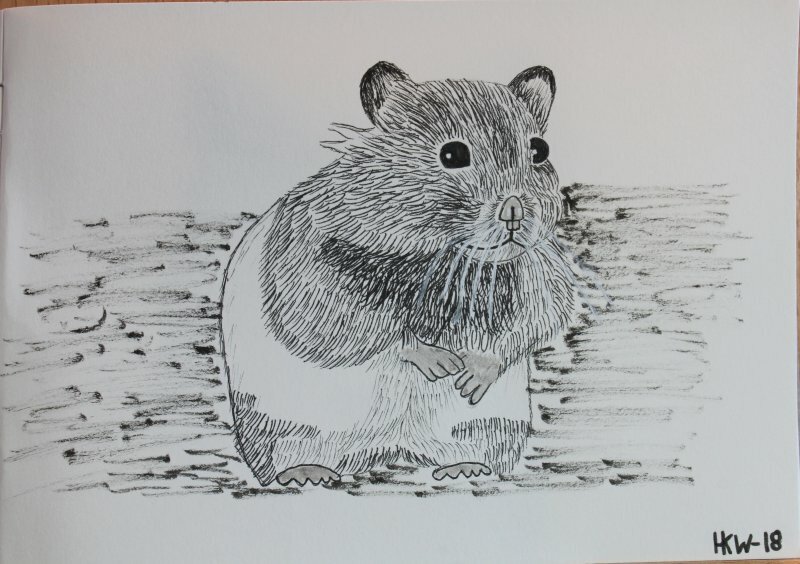 My hamster was supposed to have white whiskers, but they were really difficult to draw with the white gel pen. I tried white ink and white gouache, but that didn’t work well either. 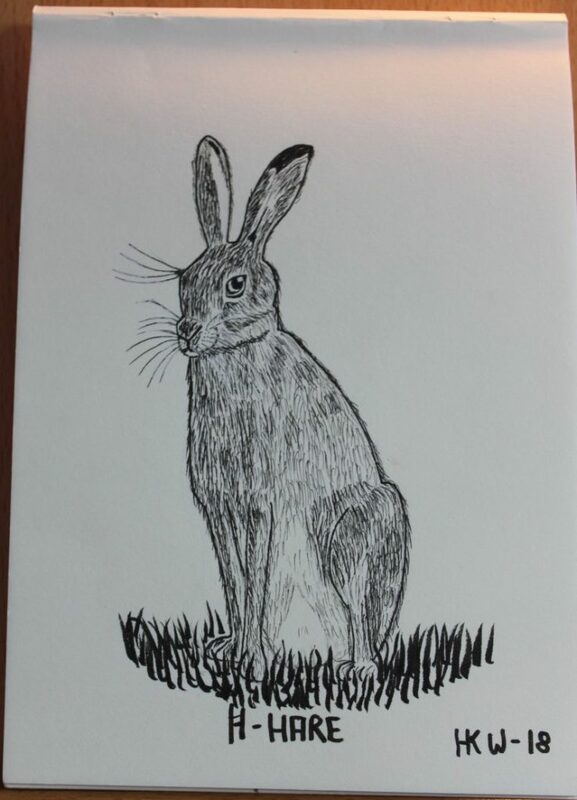 Otherwise I am fairly happy with the drawing. 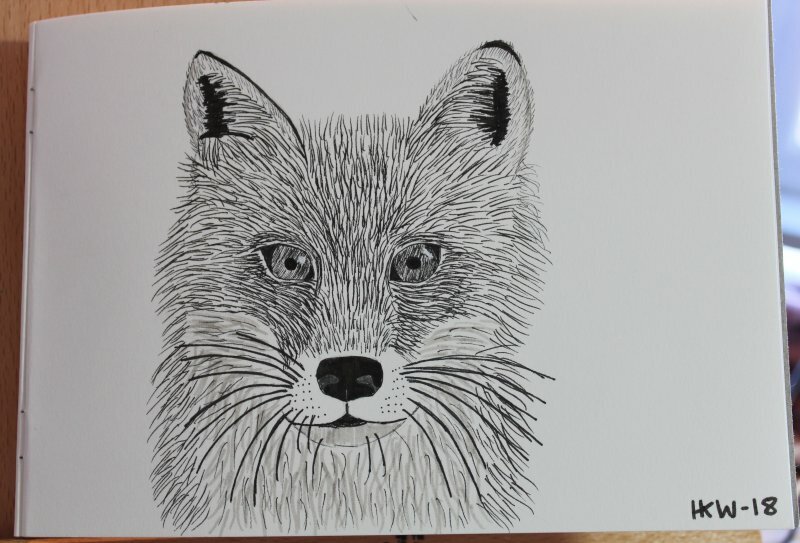 And finally on the last day, the 31st of October, I managed to draw this cute fox. Was it worth persevering with this challenge? Yes, it was. I think I learnt a lot about working with pens, using a restricted palette and simple improve my observational and drawing skills. What was also lovely was the fact that I also gained more followers on Instagram and got a lot of positive comments on my efforts. It’s nice to get encouraged by other people who appreciate your art. Would I do it again? Maybe – this will depend on whether I will have enough time. I am already thinking of other themes. Maybe just a variety of cats or birds. Now I am looking forward to using my watercolours again and my polymer clay. Oh and I will create a calendar with the 12 best drawings. I hope you like my drawings and enjoyed this post. PS: I tried to scan the images with our scanner/printer but the quality was not great. I don’t get much daylight either, which is why the images are a bit dark. We have a better scanner which I will try for the images I want to use for the calendar. Hopefully that will work.